We continue to grow: Because of a growing membership and resultant pressure on facilities we have added an eighth table to the gym. In the gym there will be seven tables available for regular play and one table for multi-ball practice. A ninth table will be available in the side room for practice vs the robot. We thank Jayson for lending us the extra table. Cornucopia agrees to help our kids program: We thank Cornucopia for agreeing to host a fundraiser in support of our “Table Tennis for Kids” program. Our fundraising evening will be in early June at the Cornucopia an 17th and Lincoln. Details to follow shortly. Congratulations: To Daisy Dai for winning the under 18’s competition in the Stiga Portland two star open. Here’s a picture of victorious Daisy with her coach Tian Wei Chen. Congratulations: To Samir Patel for winning the over 40’s competition in the State Games in Portland, and to Samir and partner Tian Wei Chen for winning the inaugural Looking Glass doubles tournament here in Eugene. Farewell to Kenichi: Over the last year we have had the pleasure of playing with Kenichi Sakamoto, an outstanding table tennis player from Japan. Unfortunately Ken is leaving us to pursue his studies elsewhere. Good Luck Kenichi! Schedule Change: We shall only be opening the club on Tuesdays and Thursdays in the month of July. This is because of the unavailability of 4 board members to open and close the facility, Kevin will run the club on Tuesdays and Thursdays. The club will return to it’s normal schedule in August. Annual members will be credited with 3 extra sessions. Board Change: Larry Benedick has stepped down from his role as club secretary so as to devote more time to his family and business. Larry is one of the founders of the Eugene Table Tennis Club and we thank him for the incredible efforts he made to help make the club a success. Jayson Yi has kindly agreed to serve on the board as secretary for the remainder of Larry’s term. Jayson brings a wealth of experience in table tennis to the board and we are delighted he has agreed to serve. Table Tennis for Kids to resume on January 23rd: The table tennis for kids program run in conjunction with the Boys & Girls Club will resume on January 23rd. Kids play will be Tuesdays and Thursdays 4:45-6:15 and Saturdays 1:30-2:30. All sessions are free. Equipment and coaching is provided. To participate on Tuesdays and Thursdays a $40 annual Boys & Girls Club membership is required. Advance sign up is recommended by calling the Boys & Girls Club at (541) 345-9939. Free play for kids on Saturdays 1:30-2:30 runs throughout the year. Christmas Information: There will be no play on Saturday December 23rd or Saturday December 30th. Happy holidays everybody! Thanksgiving Information: There will be no play on Thanksgiving day, but we have organized an extra session from 2-4 pm on Friday November 24th. Come along and work off some of that turkey!! Table Tennis for Kids to resume: The table tennis for kids program run in conjunction with the Boys & Girls Club will resume on October 3rd. Kids play will be Tuesdays and Thursdays 4:45-6:15 and Saturdays 1:30-2:30. All sessions are free. Equipment and coaching is provided. To participate on Tuesdays and Thursdays a $40 annual Boys & Girls Club membership is required. Advance sign up is recommended by calling the Boys & Girls Club at (541) 345-9939. Dr Scott does it again! As promised Dr Timothy Scott ran a second fundraiser for us in August. Excellent hor’s d’oeuvres were cooked and served by chef Gordon Ellis accompanied by Tim’s generously proved fine whisky and cigars. The event raised a further $1,000 plus for our “Table Tennis for Kids” program. We sincerely thank all participants for their extraordinary generosity. The fundraiser run for us by Dr Timothy Scott on May 6th was a great success. Everyone enjoyed Tim’s generous provision of fine whisky and cigars. The event raised over $1,000 for our “Table Tennis for Kids” program. We sincerely thank all participants for their extraordinary generosity. Dr. Scott has kindly offered to run a second fundraiser for our program in August. Watch the space for more news! Due to the Boys & Girls Club needing to prepare for their annual fund raising breakfast we shall be setting up only 4 tables in the gym tonight – Thursday April 13th. Two further tables will be available for play in the multi-purpose room. 2. There will be no play on Tuesday April 18th since the gym is unavailable. Dr Timothy Scott is organizing a whisky and cigars fundraiser to benefit our kids table tennis section on May 6th. Tim is providing the location and donating fine whisky and cigars for the event. We greatly appreciate his generosity. Following a very successful and enjoyable visit last year Stellan Bengtsson (past World Singles Champion) and his wife Angie (10 US National Championships) will be visiting us on Monday April 3rd. The Bengtssons will offer coaching to our Boys & Girls club kids in the afternoon then provide a 90 minute clinic for our members from 6-7:30 in the evening. We request a $20 drop-in fee for the members clinic to help defray the cost of the Bentgssons’ visit. Kids Table Tennis a Development: The Boys & Girls club have kindly made their facilities available to us on Saturdays to offer free table tennis to any kids that want to play. We shall provide all necessary equipment and free coaching for anyone that wants it. Details of times etc will be provided shortly. Farewell to Tim: Timoteo LeBreque who has been great supporter of the club will be playing with us for the last time in the foreseeable future on December 22nd. He then returns to his native Michigan. We plan on taking Tim out for a drink and bite to eat after play that evening. Please plan on joining us. Christmas Singles Round Robin December 17th: Our next round robin will be singles on December 17th. Either email your entry to a board member or show up punctually at 1.30pm to play. Singles Round Robin June 18th: Our next round robin will be singles on June 18th. Either email your entry to a board member or show up punctually at 1.30pm to play. Stellan Bengtsson (past World Singles Champion) and his wife Angie (10 US National Championships) were our guests on Thursday March 24th. This was a great visit, Stellan and Angie circulated the room, watched our players in action, then gave them advice and some coaching. There was also a singles demonstration match between Aron Zhang (U of O #1) and Micheal Groom (OSU #1), Michael outlasted Aron to win in five games after weathering a furious assault by Aron in the first two. Both players demonstrated great sportsmanship and played some spectacular points. The combatants, the coaches, and some club members met after play at High Street Cafe to eat, drink, and discuss the days events. We hope and believe Stellan and Angie will visit us again soon. Their return is not to be missed, ideally we will persuade them to give us some kind of multi-day clinic next time. New Venue, Days, and Times: The Eugene Table Tennis Club has moved to our new home, the Boys and Girls Club of Emerald. Our sessions are Tuesdays 6.30-8.30, Thursdays 6.30-8.30, and Saturdays 1.30-3.30. For details of our new venue and how to get there click on the Location tab above. The Boys and Girls Club have been very welcoming to us, and there is a plan that after a settling in period we will run a table tennis program for them. This is an exciting opportunity to introduce some new young players to the game. We hope everyone will pitch in and help coach. Christmas Play: The club will not meet on Christmas Eve or New Years Eve, Dec. 24th and 31st. Happy Christmas to all our players! 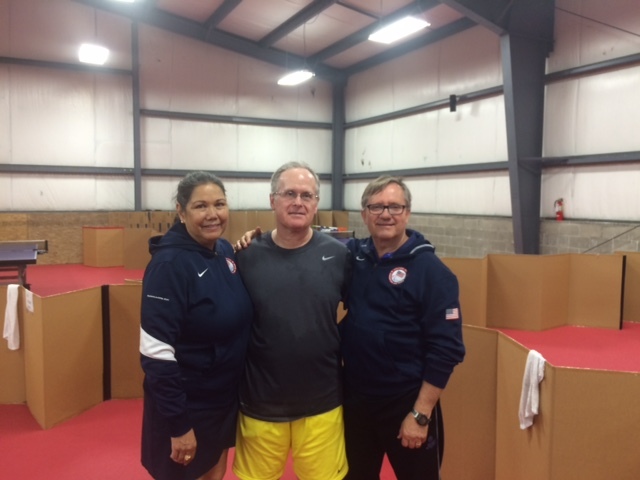 Clinic with Stellan and Angie Bengtsson: World 1971 singles champion Stellan and his wife Angie, 10 times US champion, have agreed to hold a clinic at the ETTC in March of 2016. Details to follow. First Summer Barbecue: Our first summer barbecue was a big success. Many thanks to all who contributed to the event. Special thanks to Gordon Ellis for cooking the ribs. “Better than on Beale street” said President Vincent! Improved Lighting: We have just improved the lighting in the gym by covering the windows with partially transparent material. The improvement in terms of ball visibility is striking (no pun intended). Sponsorship Deal: We have just agreed with XuShaofa Sports that we will be using their seamless 3-star poly ball in all our official club competitions. Video coaching available. Upon request Grant Brown will video and analyze your play. He charges $15 for 30 minutes of this service and donates the proceeds to the club. Thanks Grant! March Kids Clinics. Following the success of our first adult clinics we held Kids Clinics on March 14th, 21st, 28th and April 4th photos of this event may be found at Kids Play. Poly Balls: Ron Vincent has acquired for us two dozen 40+ Nittaku 3-star Premium poly balls. Come and try them out. These things are currently rarer than diamonds! We now have a selection of different types of poly balls available at the club for you to try. Several of our club members prefer the Xushaofa and Palio seamless balls.